More choux pastry! These little savoury choux puffs were inspired by a recipe posted on Foodbeam on Wednesday. Perfect timing! 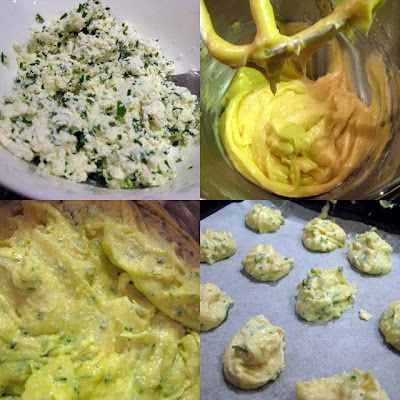 You add a mixture of ricotta and chives to a basic choux pastry recipe. Fanny deep-fries hers, which look incredibly delicious and crispy, but for the purposes of party planning, I wanted to see if oven-baking would work. In the above photo, they look great, but they weren't crispy, and deflated pretty much instantly. My mum said it was because the batter must have been too wet. Even though they didn't look great, the upside is that they tasted good, especially sprinkled with generous amounts of good salt. I've frozen the remaining deflated puffs, and will probably bring them out to go with soup or another gravy-rich meal. I'm going to have a go of some simpler gruyère gougères this week. 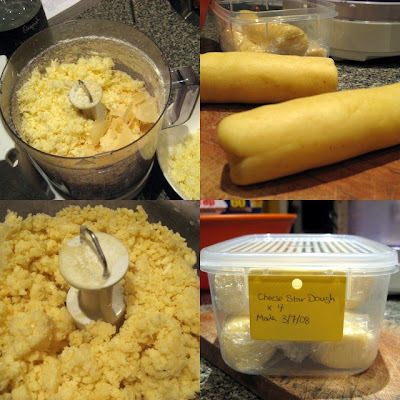 They can be kept for 3 days in an airtight container, and only contain grated cheese rather than a large amount of deflating ricotta. This pasta salad is my cheap trial-run version of Nigella's festive fusilli, from Nigella Express. In the original recipe, you mix together vodka-steeped sun-dried tomatoes with cooked pasta and mascarpone. Finally, you sprinkle parmesan cheese and parsley over the top. For my trial, I greatly decreased quantities and replaced mascarpone with cream cheese. You see, I'm more likely to eat leftover cream cheese (on toast or whatever), whereas a remaining half-tub mascarpone is likely to grow mould and go feral in my fridge. On my initial taste, I found it a bit bland, but after the first few mouthfuls it became addictive. Very nice at a warmish room temperature. The next day the dressing had congealed unattractively, but I think this wouldn't have happened with mascarpone instead of budget cream cheese. I think it will make a good, filling addition to the buffet. Of course, I'm not going to call it Festive Fusili, but will rename it "pasta salad with mascarpone and vodka dressing". Much more descriptive. And I'll serve it at room temperature! Cheese stars rock! (Remember?). For ease, I'm making them in rounds instead of stars. I made up a quadruple batch of dough, wrapped it well and stashed it in the freezer. Later on in the week, I'll slice and bake them! These are going to be nibbles with drinks. I want something warm and substantial for the hungry hordes once the canapés are done. If we're standing around, we'll need an easy-to-eat stew or hot-pot, preferably boneless. This is where Nigella's coq au riesling comes in. From Nigella Express, it's very, very simple. It's just a matter of cooking together leeks, boneless and skinless chicken thighs, mushrooms and bacon in riesling for about 40 minutes. Ta-dah! I made a trial half-batch, and thought it was delicious. In fact, I found it similar to many of the long-simmered, preparation-intensive stews from How to Eat. The only problem is that it looks quite unattractive... even a good scattering of parsley couldn't disguise that murky grey colour. I'll be considering other stews over the next week, but may very well come back to this one. Just put in food colouring! Ta-dah! Thanks for showing us all these preparations! I love party planning through your eyes!